As we move further through Autumn and closer to Winter thoughts often turn more inwards as we reflect on the year to date and our achievements and respond to the natural seasonal shift to withdraw and retreat. I am a huge fan of visioning, dreaming, meditation – call it what you will – we all do it in some form or other but more and more Leaders are now citing the benefits for themselves and their business. Finding and allowing SPACE to let ideas percolate before taking action can be hugely beneficial. The Stillness Project is a movement of change and has a mission to bring the very essence of who we are back into our lives… STILLNESS. Founder, Tom Cronin spent 26 years as a broker in finance trading inflation swaps and bonds for the banks in Australia. 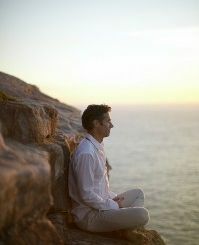 After suffering a lot of stress in his job, he turned to meditation to help manage the symptoms. Men like Tom give me heart that we will see a world where the traditional masculine and feminine led behaviours blur and we combine connection, happiness and calm with business prowess and drive. We can still be focused and ambitious but without the burnout and chaos.